Kronos is the king of the Titans, a descendant of Uranus! All that exciting Greek mythology and big-budget movies aside, here he’s the star of a 5-reel slot from WMS that you can check out on all devices and operating systems now. Apart from those five reels, the numbers you need to know are these: the theoretical return to player is 95.86% with estimated variance, medium. There are between 60 and 100 pay lines depending on the game segment you’re in, and the maximum win is 250,000 coins. Stakes are from 0.20 coins to 50 coins. Loads of extras are chucked into this game, including a respin feature, symbol upgrades, fixed jackpots and up to 75 free spins! Kronos Unleashed slot has quite a busy design. There are the usual five reels, but the extra-size symbols mean that the reels are long, and there are eight rows on the screen. And at the top of it all sits Kronos himself. He looks very impressive – frightening really. To the left of him is a jackpot table and the balance info, to the right is the play button and the betting information. This is all set against an ancient cityscape. So, there’s a lot going on, which is fine on a big screen, but it’s not so great if you’re playing on a small mobile, and a lot of modern designers are really bringing their reels – the thing we’re all interested in – to the fore. The soundtrack is good though – very atmospheric, film music – and the overall atmosphere is impressive. The reels are filled with the usual card symbols at the bottom of the pay table. Above them are the winged horse, Pegasus; a coloured set of three Kronos – gold, red and purple, with purple the top payer at 30 times stake for a reel-full. The wild is a temple, and Kronos symbols work as bonus symbols. The Lightning Respin is triggered by a giant Kronos fully in view on the first reel, awarding you three respins with the symbol in place and extra symbols, including power-up symbols. Paylines are added with the special arrow symbol, which can boost the playing area to 12 rows with 100 pay lines. A plus symbol boosts the top-paying symbols’ pay-outs. The Jackpots are set off by a lightning symbol. This is a single spin of a jackpot reel, with four – Mega, Major, Minor and Mini – jackpots to play for. With a top prize of a 50,000-time stake, this is a feature you’ll love to see triggered. Free Spins come from the scatter symbol – a sun – with the possibility of as many as 75 free spins. Kronos Unleashed slot machine is a complicated game! In all honesty, it’s just not possible to fully explain all the features in this short review, so we do recommend you take a good look around the help and information features on the machine before you play. The graphics too are busy. 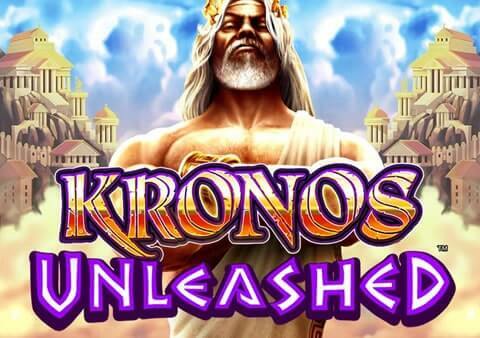 Kronos Unleashed slot is a game for someone willing to get stuck in a really involving experience. Don’t be put off though, anyone who’s played online video slots will soon be clicking happily through the options, and looking for what might be some very high payouts.